The US release of the Boy and the Beast movie sold a total of 14,001 copies in its first week on sale in June. 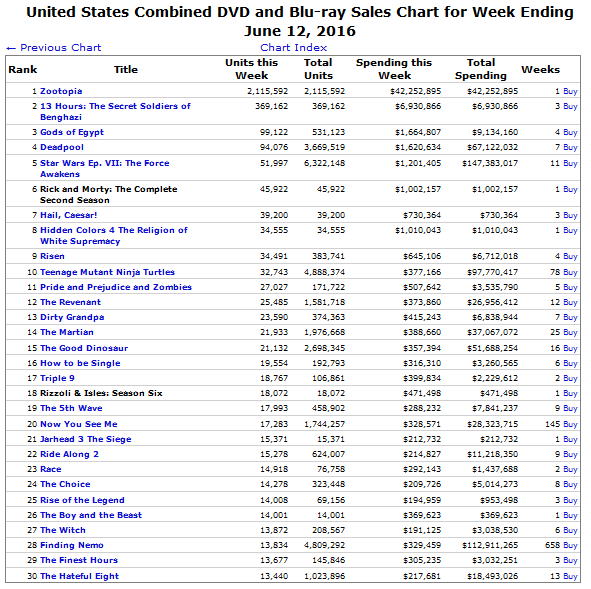 The figure splits up into 12,146 BDs and 1855 DVDs. Source picture and stray thoughts included below. This is a good bit worse than what Eva 3.33 (23,058 BDs, 4832 DVDs) ranked in its first week back in February. A formula estimate based on batb’s ranks put the DVD value at 1255*3=3765. * The BDs are a bit tricky, since our forumula only goes down to the 40th rank. But if we replace the three sub-40 ranks from that week (14, 33, and 39) with 40 and calculate, we get a lower bound of 10,876 BDs, which is eerily spot-on. I’m starting to get a pretty unscientific feeling that ranks in the #20-30 range are worth roughly 3000-4000 in sales, looking primarily at BatB this week and Eva earlier this year. This isn’t scientifically solid at this point, but I will look to test that hypothesis going forward with any other high rollers we see this year. *Occasionally, I wonder at how much the DVD estimates seem to alternate between 1x and 3x the estimate, with this being one of the former cases. This entry was posted in Articles, Fun With Numbers and tagged Anime, Bakemono no Ko, Fun With Numbers, The Boy and the Beast by torisunanohokori. Bookmark the permalink.